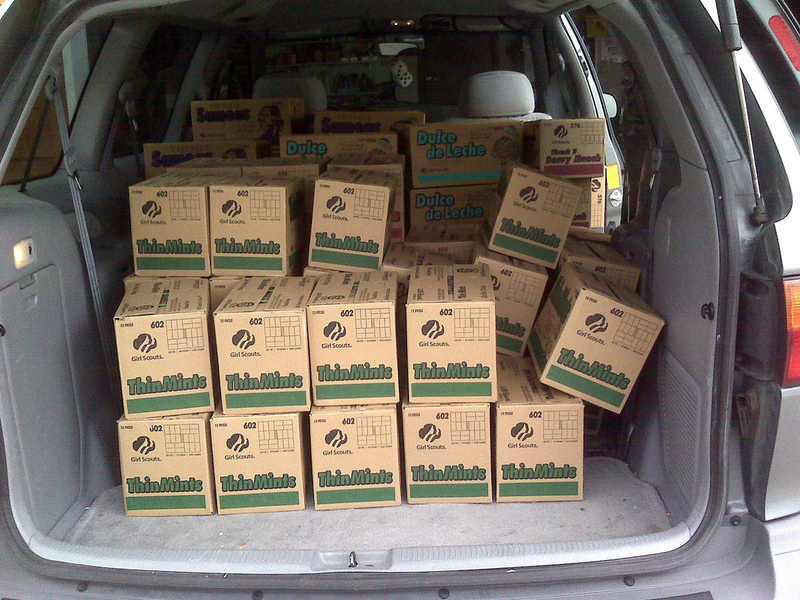 And *someone* ordered a shitload of Trefoils. KELLYANNE CONWAY [shoving her phone in HOPE HICKS’s face]: Look—he’s drenching a hoagie in lighter fluid and then fire-bombing the Airbnb he’s staying at. Just like that extremely non-problematic movie the President doesn’t know exists. GARY COHN [whispering]: Jared, double cut me. KUSHNER DAUGHTER [sensibly]: You cut Gary on line and then he cuts you. GARY COHN [neo-liberally]: That way, I keep my spot on line and you get to skip ahead of everyone behind me. KUSHNER DAUGHTER [conveying to her colleagues that while she may not have attended the State of the Union, she did check Twitter this morning]: It’s the perfect metaphor for the New America. GARY COHN [into his phone]: Okay, so look. I agree, but the world isn’t going to actually burn. It’s going to keep heating up. Gradually. KUSHNER DAUGHTER [to JARED]: Congratulations, Dad. You bought the most boxes. JARED [pulling the order list up to his eyes and recognizes that STEVE BANNON wrote down his name and the number 50 down in the Trefoil category]: This isn’t my handwriting. [JARED realizes his DAUGHTER already knows it’s STEVE BANNON’s handwriting.] What’s my prize? KELLYANNE CONWAY [truthfully, for once]: Those aren’t Girl Scout cookies. Those are Entenmann’s. KUSHNER DAUGHTER [conscientiously]: They were sitting there in the grocery store and I felt bad for them. JARED [to himself]: They’re donuts. They’re not even cookies. HOPE HICKS [pointing to the girl in a wheelchair on her box of cookies]: Do you think this is an actual Girl Scout or, like, an actress? GARY COHN [avuncular, to JARED]: So, do you want to tell me how you got your black eye? JARED [quietly]: I ate asparagus. GARY COHN [moving capital seamlessly across international borders via a few text messages] And then you got a whiff of your own piss, and it made you pass out and you fell into the porcelain. Say no more; I understand completely. STEVE BANNON [driving a riding lawn mower that was manufactured overseas]: Who doesn’t love a cookie? SARAH HUCKABEE SANDERS [blandly]: Steve, what have you been up to? IVANKA [showing up to work on a Wednesday for the first time in her entire life]: Besides brewing his own mead?